Before I became a mom, I never imagined the sheer volume of clothing one child could accumulate. 2. Different brands of children’s clothes are sized differently. Because of this, more clothes are in my family’s drawers and closets than logically should be. 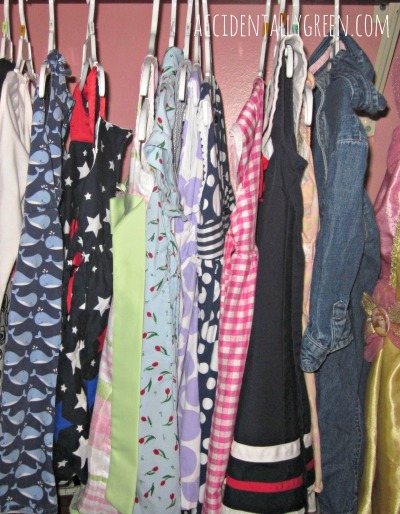 Since my children were newborns, I’ve always had a variety of sizes of clothes washed and ready for them to wear. For example, right now my son’s drawers are filled with clothes is sizes 4, 5, 6, and 7 – and he fits into all of them. 3. As a bargain shopper, I love to stock up on clothing for my kids when I find a great deal. When I’m at a thrift store and discover a pair of boys’ jeans that barely look like they’ve been worn (don’t most boys wear holes in their jeans??) or a charming dress for my daughter, I buy them – it doesn’t matter if the clothes are in my kids’ current sizes or three to five sizes too big. When my bargains are in sizes that are too big, I store them in our basement so I have a reserve for unpredictable growth spurts. While it’s incredibly handy to have a variety of sizes on hand, it also leads to the clothing accumulation predicament. Since my husband and I are fairly confident that we won’t be adding to our family any time soon (if ever), I don’t want to keep hoarding children’s clothes once our school-age children outgrow them. There comes a time for every family to part with baby belongings. I reached my farewell to baby clothes a few years ago before a major move. I kept a very few outfits that I adored – for the sake of memories and the very off chance that we’ll have any more children – and I got rid of the rest. How do I typically get rid of children’s clothing? I give them away to friends, family members or local charities. I sell them at an annual garage sale or a local consignment shop. 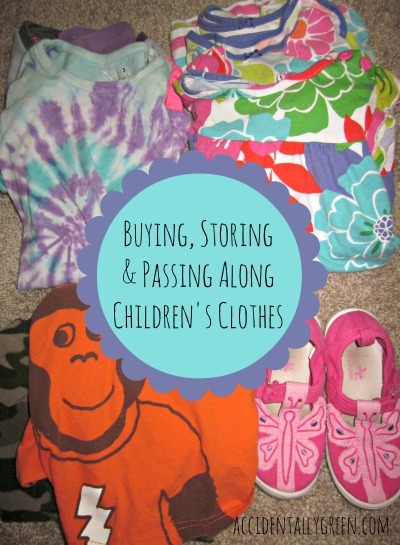 What do you do when buying, storing and passing along children’s clothes? « Help! I’m Working Too Much to be Healthy! I buy ahead too..but now I found out we are having a girl after 3 boys, its time to say bye to the boy clothes. Do you give them all yo one person? I give a little here and there, just to spread the love. :) Recently I also started taking much of our outgrown clothing to a local consignment store. They sell everything for me, and in return I get credit at the store, so I’m basically just trading clothing with the store. It’s nice because it has almost eliminated any clothing expense.